The guys from across the street do this the whole summer long: sunbathing on the rooftop. They even BBQ there and I envy them for that, cause they have a flat roof to do so. Well – in secondlife it is way easier. So I went to a friends house for some rooftop sunbathing. The shorts I am wearing are rigged mesh and come from Redgrave. They are their gift for the Make Him Over Hunt. And I promised you to show you some more goodness from The Amira Gacha Festival – SUMMER BY THE SEA. The sunbathing towel comes from STATUS poses and has a martini glass, a smartphone and the rare green one has even a beachball (that looks like an eyeball). The towel has three cute poses and is all kinds of fun. Next to the shown red and the rare green one you can get it in orange, teal or purple. Finally Friday! And since I spent my day yesterday in the libary I decided to take a break today and to chill a bit on the wonderful pier from PRIME. The pier is the current huntgift for the Summer Breeze Hunt and it is just way too cute. It is not too heavy (15 prims in total) and has neat animations (single and couple). So this one is a brilliant huntgift you definitely should get. And since it is kind of a slacker day today I also wear some comfi clothing I found at the Mens Dept. By the way – in case you did not get the news: the Mens Dept. has moved its location! It can be now found here. But back to my outfit. The Polo Shirt is from [LV] and you can choose from 3 styles which differ by the color of the printing. It is sculpted with way easy to fit prims. Very reasonable made and finally some Polo Shirts. The shorts are the Postman Shorts from 22769 ~ casual couture also available at the Mens Dept. Not that I would be that acrobatic in RL – I most probably would break my neck if I ever try to do this. But the meshed Brentwood Stool from Bounce This Poses is definitely all kinds of fun. It comes with 4 sitting, one standing and – well – the balancing pose. 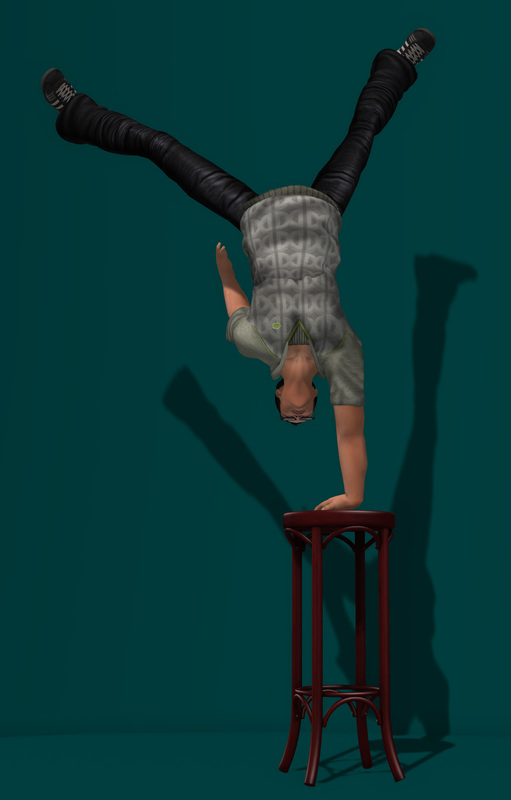 The detailing on this stool is wonderful – and if you have a bar in SL and want to have some fun you better jump directly to the Mens Dept. and get yourself one since the Brentwood Stool is copy. Anyways – the poses are extremely well done – no crazy legs, hands or moving heads. Also, and this is important for me since – as you know – my avatar is rather tall, the poses are way easy to adjust. In other words – get it, it is decent, it is fun. The half hoody from [Sheep Door] is another great find from the Mens Dept. Yeah it is not mesh, but the subtile texturing is brilliant. Also the sculptwork is not too bad. I love how sloppy the jumper “flows”. And finally the Roux Readers from BALACLAVA!! : you do not only get the nerdish glasses in the purchased pack – you get the shades also. And the female versions are also included. There are many colors you can choose from – I decided for todays look to wear the black ones. today is the Big Day … Culture Shock 2012 finally opens its doors for public (at 4PM SLT) . And all the goodies Nestor and I have shown you before are finally available! And sweets, there are so many awesome items waiting for you, that I had to clone myself for todays blogpost to show more than one. The pose and prob I’m using in this blogpost is available at the venue. Let’s start with the items. This great prob is from Sparrow Tree Studios and called Platforms. In each of the three Platforms are different poses. You can control them by menu. The dresses I’m wearing are from justB, 22769 ~ casual couture and PM Purple Moon Creations (left to right). The items from justB and 22769 are rigged mesh. Even if they are in different sizes included, I recommend that you try a demo for fitting before purchase. The Jude Boots I’m wearing are from Ingenue. Yes, it’s always the same pair, but you’ll find them displayed at the event in different colors. And as with so much stuff in the credits, I’ll better start them now. All the credits start at the left outfit. See you at Culture Shock Sweets .. and remember, you shop for Doctors without Borders. So no need for guilty conscience after shopping !